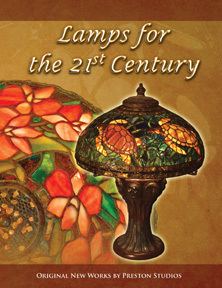 Wardell Publications will be launching their new ebook “Lamps for the 21st Century” Friday, March 23, 2012, 4-9 pm at Timothys in Winter Park (north end of Park Avenue, less than a half block from the Morse Museum). The new eBook features embedded videos of John Emery and Jerry Preston at work on a lamp as well as some of the amazing works they’ve created in stained glass lamps over the past 35+ years. At 5:30 pm John Emery will start “inspiration tours” over to the Morse (Free Fridays there), explaining his sources of inspiration and the resulting works at Preston Studios. AND, there will be a few new lamps on display, too!